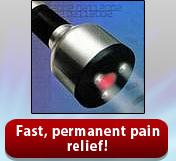 The 830Laser sends light (photons) into your injured tissues and stimulates healing and reduces pain instantly. The low level light can penetrate 2 inches into your body without being absorbed by the skin, fat, or blood. No heat is generated so it is safe for use anywhere* on the body. Once the photons find the injured tissues, they stimulate and energize the cells to repair and strengthen at a remarkably fast rate. Collagen production is stimulated so the ligaments and tissues grow stronger than with normal healing! This laser therapy treatment does NOT wear off like most medicines, electrical stimulation, heat or ice. When it reduces inflammation it stays away. It increases your body's own healing power and enhances that process. True healing. If you don't reinjure the area, the pain should not return.